After a decade of telling adorable stories about each other on talk shows and looking like real-life transatlantic royalty on the red carpet, John Krasinski and Emily Blunt have finally made a movie together. But unfortunately, their new film is definitely not for everyone. In A Quiet Place, which was also co-written and directed by Krasinski, the couple star as Lee and Evelyn Abbott who, alongside their two kids, live in absolute silence, to avoid certain death at the hands of an extraterrestrial monster sensitive to noise. Yes, the beloved, hilarious couple are starring in a horror movie — and if you’ve seen the trailers, you know that it is supremely terrifying. For the easily scared (ahem, myself) who may not be able to stomach A Quiet Place in theaters — or even, the comfort of their own home for that matter — it’s likely a *bit* disappointing to miss out on the A-list couple acting alongside one another. 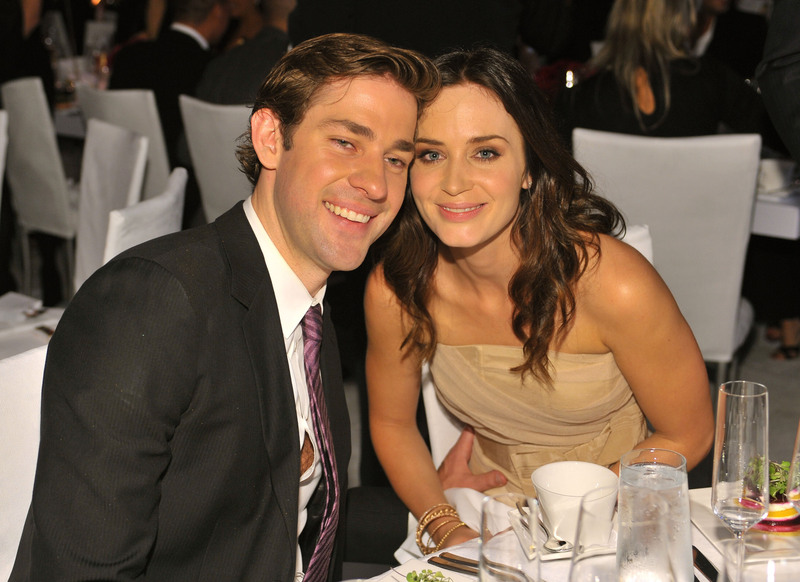 However, while we may not be able to see the film, we *can* relish in Emily Blunt and John Krasinski’s real-life adorableness. They say the couple that pranks their neighbors together stays together, right? The Leatherheads actor was backstage preparing to present an award when Blunt won her award and rushed onto the stage to celebrate! The world was instantly a better place. So while all your horror-loving friends are seeing A Quiet Place, spend 95 minutes of your own time remembering just how adorable Emily Blunt and John Krasinski are. You know, for about the billionth time.